Cruise along the coasts of Portugal, Spain, and France to the historic River Thames in London. During your voyage, enjoy visiting many World Heritage sites and a day on the historic D-Day beaches of Normandy! Save $1,000 per person when you book by April 19, 2019! 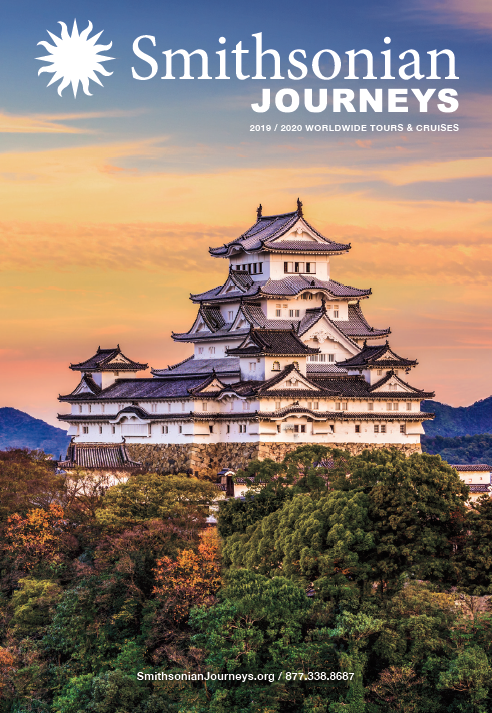 Experience some of the rich highlights of England, France, Spain, and Portugal—four nations that have had a major impact on European and world history. Portugal: Explore charming Porto, located at the mouth of the Douro River, which is renowned for its port wine. Spain: Walk in the footsteps of pilgrims on St. James Way (The Camino) in Santiago de Compostela and visit the impressive cathedral, then cruise along Spain’s breathtaking Costa Verde. Delve into the dynamic city of Bilbao, with its Gothic Old City and sophisticated contemporary aesthetic, reflected in the Frank Gehry-designed Guggenheim Museum. 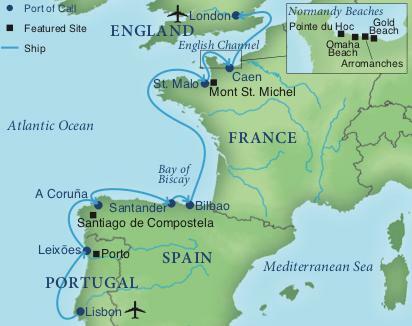 France: Spend a leisurely day cruising through the Bay of Biscay while attending presentations by your expert. Continue past the coastline of Brittany to arrive at the World Heritage site of Mont St. Michel, one of the most iconic sites of France. Enjoy a walking tour of this fortress island and visit the impressive abbey. The next day, visit the beaches and other hallowed sites associated with Normandy’s historic D-Day landings, accompanied by Dwight David Eisenhower II, author, and grandson of General and President Dwight D. Eisenhower. England: Cross the English Channel and the Strait of Dover, then spend a leisurely day cruising up the historic River Thames, possible only by small ship. Arrive in London to watch the iconic Tower Bridge raise its gates for you. Your Elegant Small-Ship Experience: Enjoy cruising aboard an upscale small river ship that features sophisticated staterooms and public spaces, superb amenities, excellent cuisine, and an informal ambiance. See more information about Le Champlain (April 2019), Le Boreal (May 2019 & 2020), and Le Laperouse, (April 2020) on the Tour Details page. Please note that the direction of the cruise varies depending on departure date and is outlined under the Itinerary section below. Each voyage will also host other leading cultural and educational institutions, which will add to the excitement and energy of the experience. Dock in Leixões and transfer to Oporto, a former Roman outpost and the center of the port wine trade since the 13th century. The city showcases great artistic and architectural treasures from the Moorish period, when Greek and Roman influences, along with tolerance between the Jewish and Christian faiths, created a coexistence of cultures in which disciplines like mathematics, medicine, optics, horticulture, art, and architecture flourished. Oporto’s historic city center, Ribeira, a World Heritage site, is a picturesque neighborhood of medieval streets lined with colorful houses. The World Heritage site of Mont-St-Michel is one of the most awe-inspiring sights in all of France—its soaring spires rise majestically from a tidal plain seemingly suspended above the sea. A pilgrimage site since the early eighth century, this fortified village began as a humble oratory and grew into an influential Benedictine monastery, becoming a renowned medieval center of learning. Dock in Caen and travel to the historic Normandy beaches. In the company of Dwight David Eisenhower II, walk where Allied forces landed on D-Day. Then, contemplate the solemn commemorative crosses and Stars of David in the American Military Cemetery at Colleville-sur-Mer overlooking Omaha Beach. The ship cruises the Strait of Dover and then up the River Thames into the heart of London, a memorable passage possible only by small ship. Enjoy a cup of afternoon tea while passing the Thames Barrier; historic maritime Greenwich; and the soaring skyline of the Canary Wharf. Culminate your voyage in a dramatic approach to London’s iconic Tower Bridge. Days 10 — London / U.S.